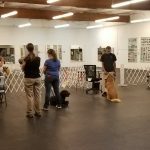 Older puppies, teenager and adult dogs come together in this action-packed class where we work on basic obedience commands and household manners. We can help with all types of training and behavior challenges. Private lessons. Agility. Competition Obedience. Therapy Dog Training. And so much more! Our next two Ten-Minute Tickers and Rent-A-Rings have been scheduled for October 21, 2018 and January 1, 2019. Click on the link for a copy of the flyer and registration form. In the event of bad weather, unsafe driving conditions, etc., any class cancellations will be posted on our Facebook page, which can be viewed using the link above (even if you are not on Facebook).